SnapPad EQ comes in two versions - round and octagon. The requests for this product have been almost overwhelming. Origen RV Accessories, parent company to RV SnapPad, announced earlier this year the development of their new EQ product. 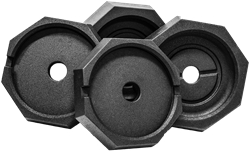 Origen is now pleased to confirm their new permanent leveling pads for Equalizer systems, SnapPad EQ Round and Octagon, is now shipping to the public and dealerships. SnapPad EQ works with Equalizer leveling systems, most commonly found on Berkshire, Newmar and Luxe Augusta brand RVs. With the addition of the EQ product to their lineup, Origen now offers four different product lines that fit on over two dozen different popular Class A, Class C and Fifth Wheel brands. Origen has also stated plans to release larger, 11.5 inch versions of their popular Equalizer & HiWay pads later this year. They anticipate a launch for these larger sizes in Q2 of this year. Prices for SnapPad EQ start from $169.99 to $199.99, depending on the package. Origen also offers a discount for veterans, as well as wholesale pricing for dealers. To learn more, visit the RV SnapPad website here.